Following up on my post from last week on the report of the Intelligence and Security Committee (ISC) of the UK Parliament, which inter alia recommended that British law for the first time introduce distinctions between citizens and non-citizens for the purpose of regulating electronic surveillance, I’d like to briefly comment on another relevant development. Amnesty International last week also published the results of a major public opinion poll conducted in 13 countries, in which 15,000 respondents were surveyed on a number of questions regarding surveillance. The upshot of the poll is that there is strong opposition to US mass surveillance programs in all of the countries surveyed, and this is also how Amnesty chose to present the results (Amnesty’s press release is available here; the full results are available here; an analytical piece by Chris Chambers, one of the researchers on the project, is available in The Guardian). Are people more tolerant of the government monitoring foreign nationals than its own citizens? Yes. In all surveyed countries, more people were in favour of their government monitoring foreign nationals (45%) than citizens (26%). In some countries the rate of agreement for monitoring foreign nationals was more than double that of citizens. For instance, in Canada only 23% believed their government should monitor citizens compared with 48% for foreign nationals. In the US, 20% believed their government should monitor citizens compared with 50% for foreign nationals. These results suggest the presence of a social ingroup bias: surveillance is more acceptable when applied to “them” but not to “us”. We can also look at this ingroup bias in a different way – by specifically counting the number of people who disagreed with government surveillance of citizens while at the same time agreeing with surveillance of foreign nationals. 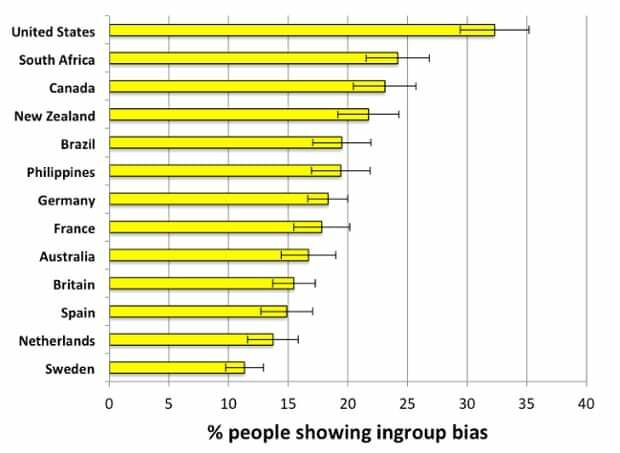 In most countries, fewer than 1 in 4 people showed such a bias, with Sweden showing the least favouritism toward citizens (approximately 1 in 9). However, the US stands apart as having the highest ingroup bias – nearly 1 in 3 US respondents believed their government should monitor foreign nationals while leaving citizens alone. 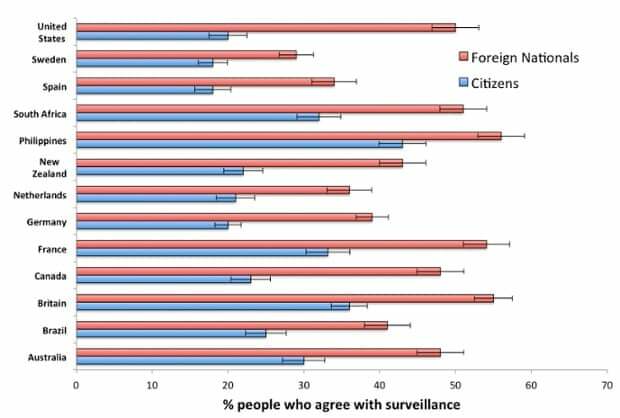 These graphs powerfully illustrate the importance of citizenship bias in public discourse on surveillance. For example, while they show that in all countries surveyed there exists a degree of citizenship bias, they also show that in some countries – especially the United States – that bias is particularly strong. This inevitably has an impact on the legal and political debates on surveillance, which in turn also (re-)shape public opinion. Note how the poll questions were not actually designed to investigate ‘pure’ citizenship bias, but were intermingled with issues of territoriality, i.e. the location of the individual subject to surveillance (much as is the case with many surveillance laws): the first two questions thus ask whether surveillance should be allowed against citizens and non-citizens living in your own country. The third question, on the other hand, refers to ‘people living in other countries,’ who I imagine most of the respondents would have assumed not to be citizens of the respondents’ own country (i.e. a French person living in France, rather than a US citizen living in France). The third question would have worked better had it been split into two, referring to both citizens and non-citizens living in other countries. Even so, the results are very instructive. Citizenship bias is most prominent when it comes to foreign nationals present in the respondents’ own countries. Legally, however, as far as I am aware, even states that do make citizenship-based distinctions in their laws regulating surveillance do not distinguish between citizens and non-citizens when the non-citizen is present in the state’s territory – for example, if I as a Serbian national visit New York City for tourism, my privacy is basically just as protected under the Fourth Amendment or FISA as if I was a US national. On the other hand, citizenship bias is much less prominent when it comes to foreign nationals being subjected to surveillance in their own countries. If we look at the answers to the third question of the poll, we’ll see that the responses are much closer to those of the first question than to the second. In many countries the responses to the third question are even more restrictive than to the first. If we take the UK as an example, while 36% of the respondents believe that UK nationals in the UK should be subjected to surveillance, and 55% believe that foreigners in the UK should be subjected to surveillance, only 34% believe that foreigners should be subjected to surveillance when they are in their own countries. All countries, included the US, experience a significant drop in the affirmative answers to the second and third questions (e.g. 50% to 36% regarding the US, 48% to 25% regarding Australia, 43% to 22% regarding New Zealand ). What’s fascinating about this result is that the mass surveillance of foreigners located in their own countries in fact represents the vast majority of the type of surveillance that the NSA, GCHQ and co. actually do. And it is precisely this category of individuals who are legally protected the least, if at all (e.g. in US, Australian, New Zealand, and Canadian law). In sum, where citizenship bias in public opinion is strongest, the legal protections of foreigners are also strongest, and where citizenship bias is weakest, so are the legal protections accorded to foreigners. The noticeable difference in citizenship bias with regard to the location of the foreign national is I think relatively easy to explain: people feel more directly threatened by foreigners in their midst (even if in most places the majority of terrorist threats is actually home grown), but they do not feel as threatened by foreigners living in their own countries. What I find much harder to explain is the counter-intuitive disconnect between public opinion and the legal regulation of surveillance, on which any suggestions would be much appreciated. One lesson that we can draw from the survey in any event is that citizenship bias in public opinion does not necessarily have (let alone should have) a direct impact on the legal regulation of surveillance.